“Two Directions for the Novel,” Ms. Smith’s now-famous predilection for the postmodern avant-garde over the traditional lyrical-realist novel, is a review of both Joseph O’Neill’s Netherland and Tom McCarthy’s Remainder. Netherland, or so Ms. Smith’s argument goes, is exemplary of an obsolete kind of novel writing, the sort that began with Flaubert in the 19th Century and has continued (apparently) unencumbered until today. Netherland is thus “precisely the image of what we have been taught to value in fiction.” But what is strange about Smith’s reading of Netherland is that it seems entirely at odds with the novel itself; because of its perfection, she argues, it forces the lyrical-realist novel into “a kind of existential crisis, as the photograph gifts a nervous breakdown to the painted portrait.” Netherland, in other words, is fully aware of its alleged complacency. “It’s a novel that wants you to know that it knows that you know it knows.” In the midst of these “unhealthy times,” Tom McCarthy’s Remainder emerges to “shake the novel out of its present complacency.” It is the progressive path forward to Netherland’s nostalgic conservatism. Smith, I think, misreads or misinterprets Netherland, giving it an unfair treatment, but the greatest fallacy of “Two Directions for the Novel” is stated plainly in its title: two directions. Is the future of novel writing necessarily limited to one direction of writing over another? Are lyrical realism and the avant-garde mutually exclusive? Surely the novel-form is flexible enough to accommodate O’Neill and McCarthy. In one sense a response to James Wood’s question of which way the contemporary novel will go, Smith provides as her answer the conquering of one novel form over another. Even more than for his wordplay we cherish him for his lack of allegiance. Our Shakespeare sees always both sides of a thing; he is black and white, male and female – he is everyman. The giant lacunae in his biography are merely a convenience; if any new facts of religious or political affiliations were ever to arise, we would dismiss them in our hearts anyway. Was he, for example, a man of Rome or not? He has appeared, to generations of readers, not of one religion but of both, in truth, beyond both. Born into the middle of Britain’s fierce Catholic-Protestant culture war, how could the bloody absurdity of those years not impress upon him a strong sense of cultural contingency? Smith is wise enough to recognize an element of incompatibility between the artist and the politician (unlike politicians, “Shakespeare’s art, the very medium of it, allowed him to do what civic officers and politicians can’t seem to: speak simultaneous truths”), but her hope, implicit in the beautiful passage above, that public officials might at least look upon the Bard as a philosophical role model, is a hope that deserves to be nourished. Much of the remaining four sections of Changing my Mind – “Being”; “Seeing”; “Feeling”; “Remembering” – are very uneven in their quality. “That Crafty Feeling,” a lecture on the nitty-gritty elements of fiction writing, only confirms my belief that there is nothing quite as dull as a writer talking about how he or she writes (in the morning, in the evening, at home, at a café, upside down, etc. ), whereas the essays on Katherine Hepburn and Greta Garbo are lucid and timely (“You can have something resembling Madonna’s body, if you try. But you cannot have Garbo’s face.”) But the major failing of Changing My Mind is the inclusion of something as frivolous as a film review of Date Movie (It is, Smith concludes, is “the worst movie I have ever seen” – what did she expect?) Smith’s admirers are forever going on about her ability to consume serious literature and pop culture (even of the lowest sort), but it is to some extent her biggest limitation. Despite the obvious pleasures and gems of Changing my Mind, I can’t help but nourish a hope that Fail Better, that “solemn, theoretical book about writing” that Ms. Smith alludes to in her foreword, might eventually make it into print. 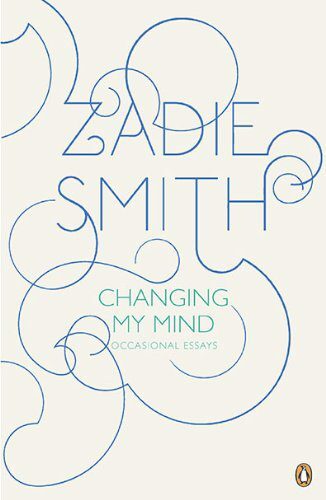 Posted in Book Reviews and tagged Changing My Mind, Essays, Zadie Smith. Bookmark the permalink. Trackbacks are closed, but you can post a comment.